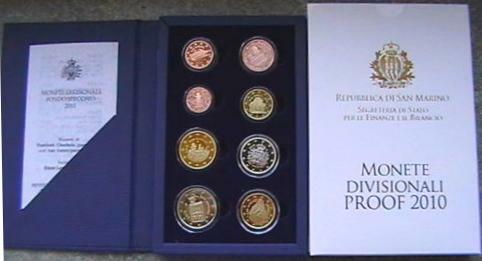 2010 San Marino Proof Set (Monete Divisionali Proof) of all 8 circulating Euro coins: 1 Euro Cent, 2 Euro Cent, 5 Euro Cent, 10 Euro Cent, 20 Euro Cent, 50 Euro Cent, 1 Euro and 2 Euro in proof condition in original case. Designed by Frantisek Chochola (obverse) and Luc Luycs (reverse); engraved by Ettore Lorenzo Frapiccini. Mintage of only 8,600.